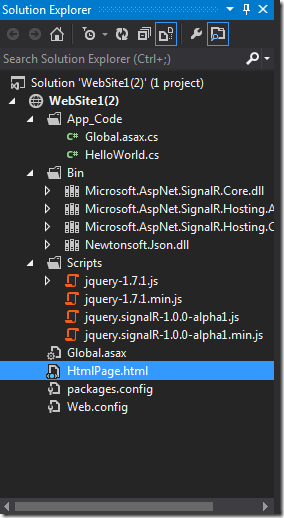 This post builds upon the basics of SignalR presented in the last post and delves into making another example using SignalR, jQuery and ASP.NET Web forms. 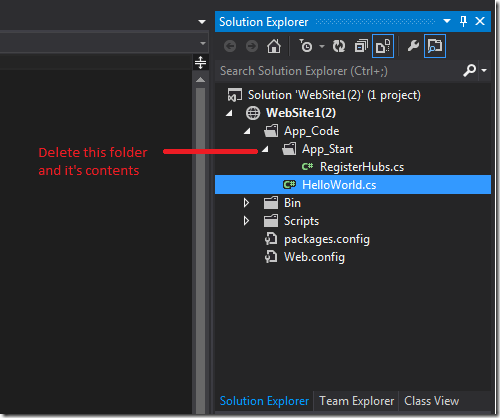 The last post showcased an elementary application, that was meant to prime up the reader on the basics of the SignalR library. This post builds upon the last post and makes a bit more involved web application,that uses jQuery UI library. 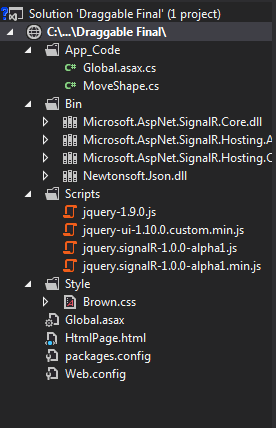 The SignalR programming unto itself will remain simple. 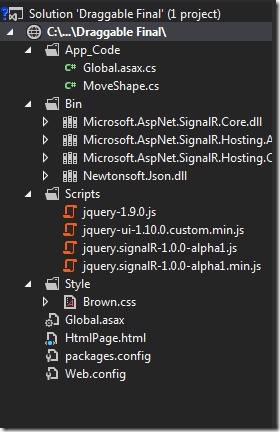 If you are new to SignalR, please first go through introduction to SignalR. Make a draggable visual element which when dragged across in a client browser, should replicate motion in other client browser(s). To do this, we will take help of jQuery UI library which builds upon jQuery library. As I have already covered the basic steps involved in making a basic application in my last post, I will keep the instructions concise. 1. 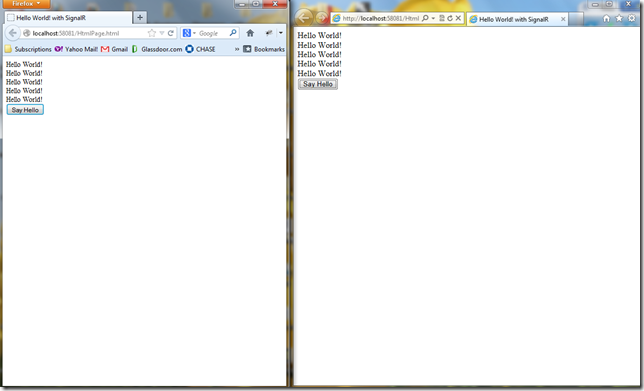 Make an empty ASP.NET Web forms website. The Move method will receive two integer values signifying the screen coordinates of the visual element on screen. The method will invoke method “shapeMoved” available on the client side and pass on the two coordinates, it received originally. These coordinates will then be used on the client side to position the visual element accordingly. 3. Add a Global.asax class and register hubs in the “Application_Start” method. 4. Add a css file with the following code. Note that the code is relatively simple and a lot of it is simply providing visual enhancement. It can be a lot simpler for this example. The code having the id of draggable is the code that will make up the visual element in the form of a rectangle with a cream colored background. 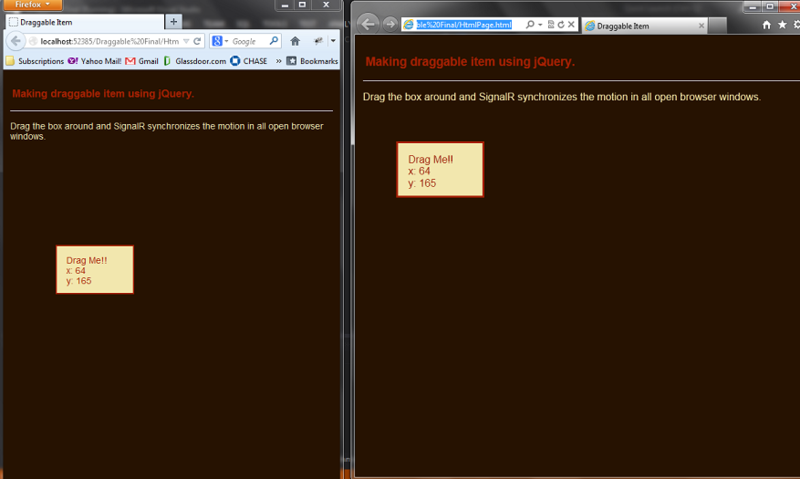 Drag the box around and SignalR synchronizes the motion in all open browser windows. Now run the website in Debug mode and you will be able to observe a box which when moved in in client browser also moves in other client browser(s). This post was a bit heavy on the jQuery code, not so much on SignalR code, but shows the vast potential of the library. 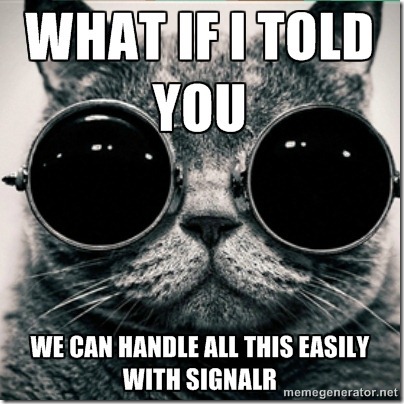 Anywhere, where you might require real time functionality between server and client(s), you can use SignalR. SignalR is the newest member in the .NET ecosystem fully supported by Microsoft, offering an abstraction over the transport layer, that enables developers to make scalable applications that can have an real time asynchronous communication between server and client(s) and vice versa. 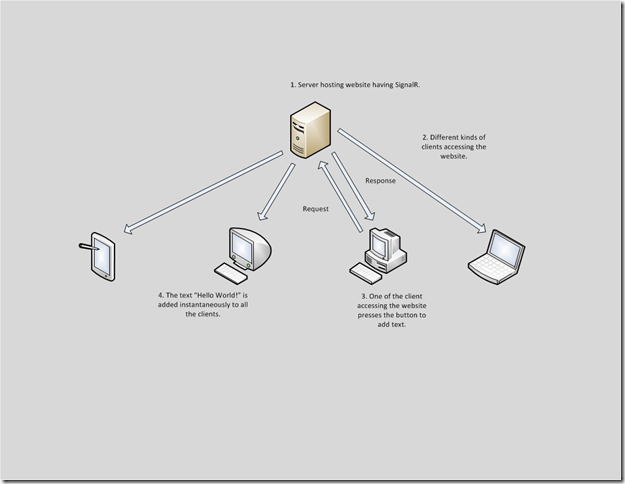 In the client server model, there are two modes of communication at play – push or pull. 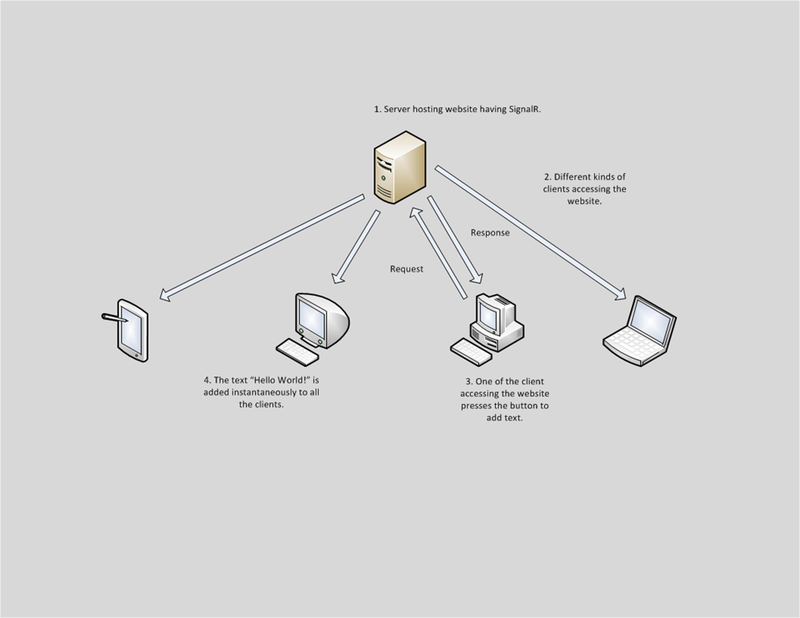 In pull paradigm, it is the client that pulls the information from the server. In push, it is the server that explicitly sends the information to the client. The web model is based on the pull technology, affectionately known as the request-response pattern. 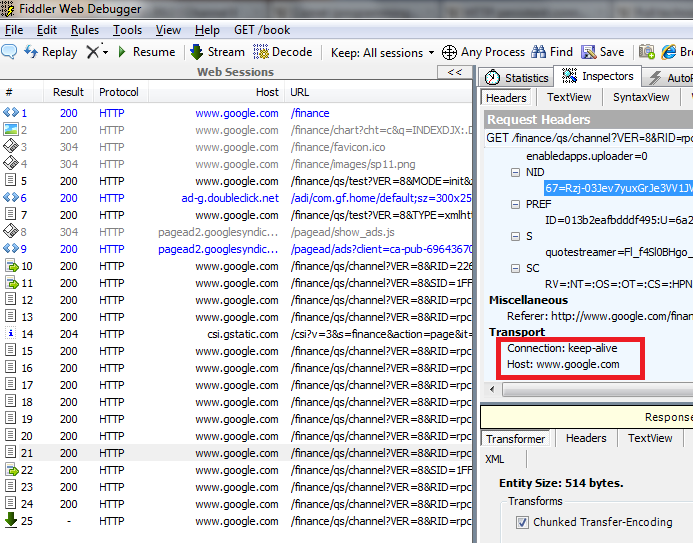 The client (browser) requests information from the server, and gets the response (web page, data etc.) Once this transaction is done the server merrily goes back into the state of amnesia. This pattern is the reason, why the web is stateless. Whenever there is a requirement of data being explicitly pushed from the server, it poses a different set of problems than what the stateless nature of web is designed to solve. You then have to keep track of connections going to various clients all the while maintaining scalability and performance. To achieve push from server this there are various kinds of hacks that are put in place, but all based on pull paradigm. The various sleights include opening a never ending connection to the server to polling the server again and again. There is even a standard term for such kinds of client-server interactions – COMET. COMET operations fall under two kinds of categories –polling and streaming. 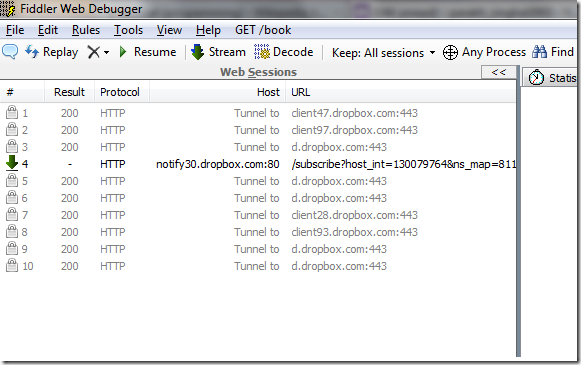 Streaming is when the client opens up a connection to the server and keeps it open. Such kind of connection is called as a persistent connection and a characteristic of such a connection is the “Connection: keep-alive” command at the transport layer level. Persistent connection is predominantly used in web applications targeting real time data which needs to be server to a variety of versions of various browsers. One fine example is that of Google Finance. Notice that it uses persistent connection to bring in data continuously about the live condition of the financial market. Google Finance uses persistent connection to update the webpage continuously. Polling is the technique when the client keeps on sending requests to the server, demanding any new data that the server might have. 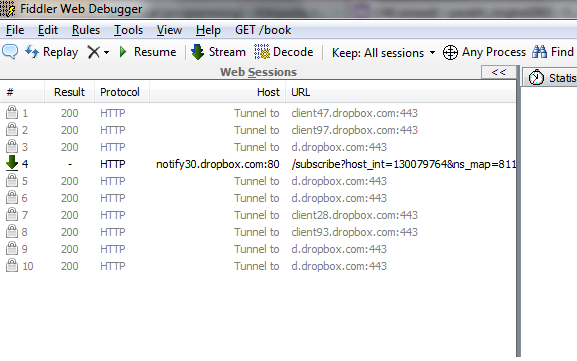 A good example of polling is the Dropbox client application. Dropbox client application in Windows 7 does polling. Yet other trick involves using an iframe, which is fundamentally an HTML document embedded within a parent HTML document. 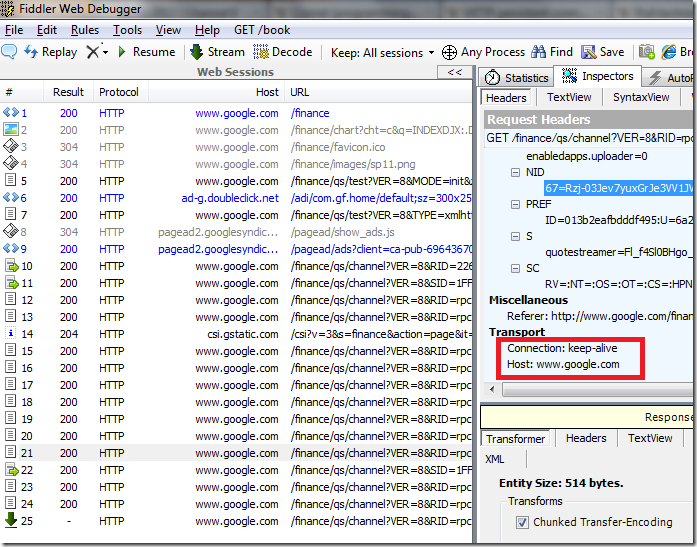 This technique is primarily used to show ads dynamically within a web page and periodically pull a new one within the iframe. Yahoo Mail’s new interface uses iframe to show advertisements. The newest technology on the block is WebSocket protocol. WebSocket is part of HTML5 draft and is truly duplex and persistent form of connection to the server side processes. But sadly, not all the browsers and more importantly web servers support websocket protocol as of today. So if you are developing a public facing web site, you cannot truly rely on websocket yet. So, all in all, right now we have a conundrum of technical tricks and an upcoming technology that is not uniformly supported by all client browsers and web servers, to solve the problem of serving real time data from server(s) to various client(s). Adding to the complexity is the fact that there are various kinds of clients available ranging from web browsers to sensors (that can use .NET Micro Framework) to native applications in iOS and Android ecosystems to desktop applications that require real time data pushed from a central server. This is where SignalR comes into play and provides a unified approach to handle the requirement of asynchronous real time duplex communication between client(s) and server. The way SignalR works is that it auto negotiates the protocol between the client and the server based on the capabilities of the pair. So if they support websocket, then that is used. If not websocket, then SignalR falls back to server sent events, if not that then forever frames and so on. So the developer is not required to worry about the protocol detection and usage and eventual graceful degradation. 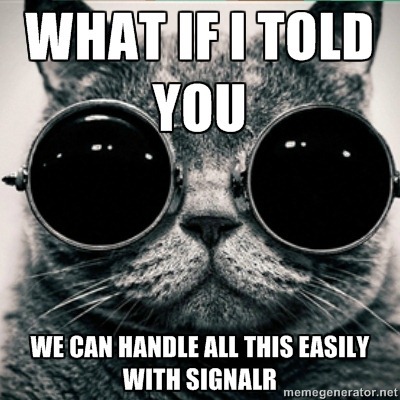 SignalR handles this automatically, all this while providing a uniform API to program against. 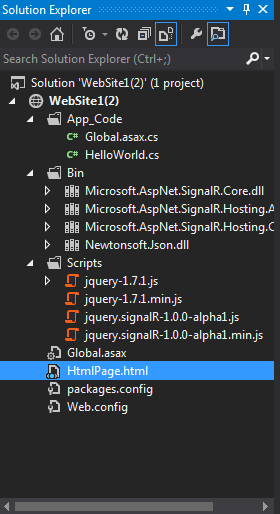 SignalR is being actively developed by Damian Edwards’s team at Microsoft and they have already released the first version in the fall update (2012) of ASP.NET. SignalR scales well and already supports SQL Server, Service Bus and key-value system like Redis. Client side API is available for .NET (4.0 and 4.5), HTML in the form of a jQuery client, WPF, Silverlight 5 and Windows Phone 8. My last post, although not very utilitarian was an exiting one for me, as it allowed me to share my thinking. This post continues the theme of my last post. I wanted to share some of the choicest videos that helps us see a glimpse of what future holds for us. See how research conducted at avant-garde institutes might completely change our lifestyle, our thinking and give and new insights into solving problems ranging from transportation mental disorders. In the first video Eric Schmidt (Chairman, Google) discusses about how ideas that had been in incubation for a long time are now coming to fruition. This specially ties into my previous post on the how proliferation of cloud computing and bandwidth are intertwined. I am big fan of innovation coming out of Google. One of them is the project of Google Glasses. It is worth noting how they have captured the facets of life where such a device might be of help. Although I doubt people will just put it on, the moment they wake up. Sebastian Thurn’s Stanley was the winner of the DARPA Grand Challenge 2005. That challenge has inspired both tech industries and auto industry to create driverless cars. Listen to him give a beautiful introduction to the concept. Simplifying complex concepts is an art unto itself and one that takes a lot of deliberate practice. Listening to Juan Enriquez discuss the direction that biotech will take and its implications on the life is mesmerizing. While advancement in technology mostly yields very tangible results in the form of automation, the time spent upon dealing with various problems can also yield simple solutions and a completely new insight. This video shows how VS Ramachandran found new insights on curing the phenomenon of phantom limb. These are just some of the videos that help us what future beholds for us and understand the power of science and engineering, and why STEM courses are important for the future of growth of a nation. Just want to sign off this post with this video of Sir Ken Robinson, emphasizing the changes in the education system that needs to be bought to help catalyze and realize the creative thinking. I hope this post made you as exited as I was when I got to revisit these videos.